Recapture everyday moments without disrupting your life. The Neuromonics Tinnitus Treatment is convenient and non-invasive, making it easy to use during most regular daily activities. A small, lightweight Oasis™ device with headphones delivers spectrally modified, precisely designed music embedded with an acoustic neural stimulus. These sounds, customized for each user’s audiological and tinnitus profile, stimulate the auditory pathway to promote neural plastic changes. Over time, new connections train the brain to filter out tinnitus disturbance, providing long-term relief from symptoms. The treatment occurs in 5 steps over approximately 6 months, with many reporting some relief immediately. Throughout the treatment process, education and support are provided by a Neuromonics-trained clinician. A specially trained clinician will meet with you to evaluate your tinnitus and hearing. After assessing your audiological and tinnitus profile, the audiologist will then discuss which treatment options are most appropriate for you, and whether the Neuromonics treatment can help. Based on your audiological and tinnitus profile, your Oasis™ device will be customized with your individual prescription. This stage helps relieve symptoms so that you can begin to experience control over your tinnitus while continuing treatment. The device is worn for at least two hours per day (or longer, if preferred or needed) during daily activities like reading, preparing meals or at the office. This stage typically lasts about two months. The goal of Stage Two is to help the brain develop new neural connections that allow it to filter out tinnitus sounds. When this happens, relief continues even without regular use of the Oasis™ device. In this stage, the device is used for at least two hours per day initially. 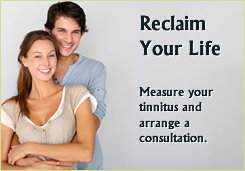 Treatment times are then gradually reduced as tinnitus disturbance lessens. This stage of treatment typically lasts about four months. At the completion of your successful treatment program, your Neuromonics clinician will work with you to develop a maintenance program you can use to continue to control your tinnitus on your own. Many people may not feel the need to use the device after treatment. Those who do typically use it for short periods of time (two to four hours per week) to help them maintain the benefits achieved.